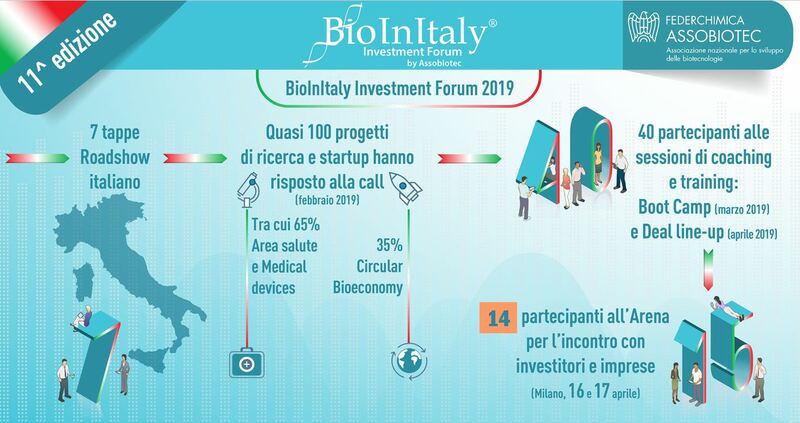 The 2019 edition of the StartUp Initiative / BioInItaly Investment Forum will take place on 16th and 17th April in Milan, Via Bergognone 34. Over the course of the two days, 14 startups selected by a panel of coaches and experts will present their projects to investors, corporations and players of the innovation ecosystem. 16th April will cover Circular Bioeconomy (biotech for environment and agriculture, biotech for industrial applications, etc. ), while 17th April will focus on Red Biotech & Medical Devices (life sciences, diagnostics, drug discovery, etc.). The event, organized by Assobiotec (the Italian Association for Biotechnology Development, part of the Federchimica organization), Intesa Sanpaolo andthe Italian Bioeconomy Cluster Springaims to bring together innovative businesses and projects seeking capital with financial and corporate investors from all over the world. Since 2008, BioInItaly Investment Forum is the key investment forum for biotechnology and life sciences innovation in Italy. The 2019 edition is organized in partnership with: Ellen MacArthur Foundation, Novamont, Stifel, LCA, Goodwin, LE2C, Novartis Oncology,Bird & Bird, Z-Cubee ITA – Italian Trade Agency. Over the course of the two days will be assigned prizes to the most promising startups in terms of pithing and investor readiness.